Paulin Jak Rranzi was born in Shkodra, Albania, on March 12, 1978. He is graduated for law. Now he lives in Bergamo, Italy. Paulin Rranzi is an Albanian patriot with many values as an intellectual and as humanitarian in helping people in need. Now, he is one of the most successful Albanian businessmen. For many years he has distributed his business in the neighboring Italy and he has in himself greater objectives for the life and his intellectual and political career. He is friend of many distinguished personalities, especially with them of Vatican. Paulin Rranzi in the year 2001 and ongoing works as leader, partner, collaborator and advisor in some companies that operate in Albania and Italy, and some other places. Paulin Rranzi, since 2010 and ongoing is a journalist of “Eagle’s Wing” magazine. Since 2010 and ongoing he is a member of Albanian League of Writers and Artists. Since 2010 he received the tasks as Goodwill Ambassador and Vice Chairman of Diplomatic Mission Peace and Prosperity. 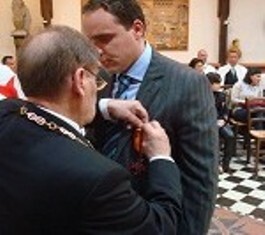 In 2010 Paulin Rranzi, as a humanitarian, is honored with the Cross of Merit from AMES, international organization, Italy. The intellectual Paulin Rranzi, with the great ambition for his career, has many other objectives and challenges to realize and to face in his life. Paulin Rranzi, as a journalist and writer, has published a series of articles for the progress of peace in the world and for its missionaries. He has also published many journalism items. Paulin Rranzi has conducted several specializations in the field of journalism, publishing and diplomacy. In 2011, he published the book “Personalities – Missionaries of Peace” (Personalitete – Misionarë të Paqes) in two different editions, in Albanian version and in English version. lobirati za mir medju narodima…..za prosperitet i napredak.